Media product portfolios are rapidly becoming the predominant shared characteristic of media companies worldwide. The phenomenon involves firms from all kinds of media--newspapers, magazines, television, radio, cinema--and is found in enterprises ranging from small, local firms to large, globalized companies. This volume is the result of a coordinated effort of scholars in the United States and Europe to explore the characteristics, processes, challenges, and implications of media product portfolios. This book breaks new ground by introducing the concepts of product portfolio management and applying them to media companies in a comprehensive manner. It draws from knowledge and methods of analyzing product portfolio management in other industries, applies that knowledge to media industries, and analyzes current practices in media firms. The process and issues of portfolio strategy, development, and management are complex and wide ranging. 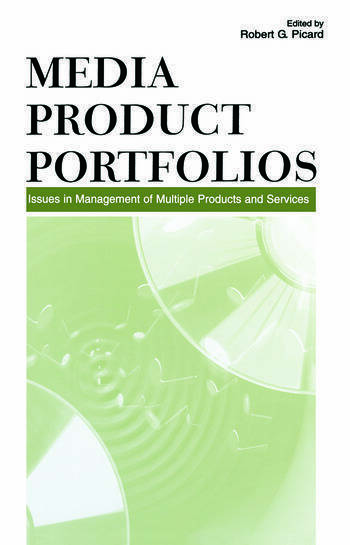 The book explores the development of media product portfolios from an interdisciplinary perspective, providing insight from business, economic, organizational, and communication approaches. The book explores why and how firms develop portfolios, how company strategy and organizational development relate to portfolios, the role of leaders in developing portfolio activities, economic and economic geography issues in portfolios, production issues, challenges in managing multiple products and operations, issues of marketing and branding issues in portfolios, personnel implications, and the unique challenges in the internationalization of media portfolio operations. Contents: Preface. R.G. Picard, The Nature of Media Product Portfolios. H.L. van Kranenburg, Product Portfolios, Diversification, and Sustainablity of Media Firms. L. Achtenhagen, Media Portfolio Development: Strategic and Organizational Challenges. E. Brundin, L. Melin, Strategic Leadership and Media Portfolio Development: Leaders and Impression Management. H.J. Martin, Clustering Media Operations: Rationales and Managerial Challenges. T. Hess, Product Platforms for the Media Industry. M. Norbäck, Cross-Promotion and Branding of Media Product Portfolios. M. Ots, Strategic Direction and Control of Portfolios: Can Standard Models Create Cross-Media Benefits? M. Hang, Issues and Strategies in Managing Portfolios Across Borders and Cultures. A. Risberg, L. Melin, Portfolio Internationalization: The Case of a Successful Concept.